Graph databases have many, many use cases, but perhaps one of the most compelling is combating fraud and corruption. Let's take a closer look at how this can be done. The shocking revelations of the International Consortium of Investigative Journalists (ICIJ), who released both the Panama and Paradise Papers, as well as the West Africa Leaks, have shown that aggressive tax avoidance and money laundering are a widespread and worldwide problem. Money laundering often correlates with other illegal activities such as terrorist financing and corruption in politics and businesses, while tax avoidance leads to political and social tensions. The total volume of money laundering worldwide is estimated at 2000 billion U.S. dollars — an incredibly high figure (for example, Germany is estimated at 100 billion Euros). No wonder governments and companies are stepping up their efforts to combat these illegal activities, leading to drastically tightened regulatory requirements in many areas. Corporations of all sizes are facing the challenge of adjusting both their business processes and risk management practices. Companies with a decentralized, multi-layered structure and a huge customer base (e.g. franchise systems) face a constant regulatory demand for risk control and network transparency on a large scale. If a business can't comply with all regulatory requirements quickly enough, it'll slow down and dry out long-term. Why Do You Need an IT System in the First Place? The huge amounts of data you deal with have inherently complex network structures. There are individuals acting in different roles for all types of entities, records documenting relationships and interactions, and millions of financial transactions, each of which could be part of a money-laundering pattern. It's self-explanatory that you can only handle this amount of data with an IT system, and KERBEROS, the solution we have built, is a good example to meet these requirements. But data is just one part of the game: A business-supporting IT solution needs to be practical, cost-efficient and flexible. Most importantly, the solution needs to be effective. Companies need a detailed "X-ray vision" beyond the first layer of huge data to effectively understand, visualize, control and mitigate their risks 24 hours a day, seven days a week, for all 365 days of a year. Fig 1. Comprehensive AML Report generated in real-time based on graph data. What Are the Challenges for Building an Effective AML Solution Within Your IT System? What would a fully digitized 360-degree risk-management and compliance solution look like if you must guarantee full compliance across a complex organization at reasonable costs? And why is it hard to build a 24×7 software tool to ensure premium compliance in an organization with a lean and cost-sensitive resource investment? It's not only the volume of the data you need to take into account, but also its structure. To store and efficiently manage these kinds of networks, you need the right database, one that has a data model optimized for connected data. You need a native graph database. Native graph databases like Neo4j, the database selected for the solution, are designed and built from the ground up to store data in the form of nodes and relationships — no other database model is as efficient and optimized for handling connected data. The other important component to a comprehensive AML solution is a flexible application platform that allows you to develop the "solution" part in an agile way. Structr, the product used here for building the application, provides built-in functionality so developers can focus on the important issues instead of being slowed down by annoying standard tasks. In addition, the entire definition of the application is stored in the native graph database, allowing the developers to evolve the application with an unprecedented level of flexibility. Fig 2. Algorithm to calculate UBO status as defined in Structr's Flow Editor. Flexibility is key: It helps developers follow the evolution of legislation, which is a moving target, but also assists in mapping the non-uniform, inconsistent regulations that international companies face. Only with a high level of flexibility are companies able to adapt their business processes and risk management practices fast enough to survive. The latest evolutionary step in the KERBEROS solution is Structr's brand-new Flow Engine (see Fig. 2). 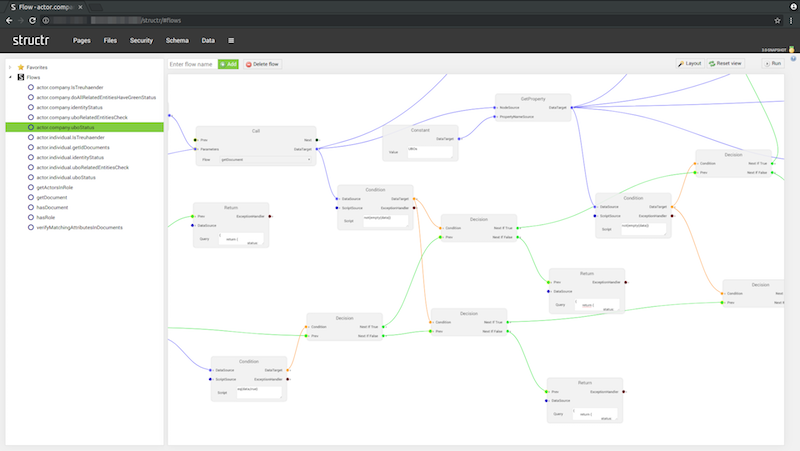 It allows business users to define and run database queries and algorithms as a graph without the help of developers, using only the integrated Flow Editor. The same graph technology that helped bold data journalists of the ICIJ to analyze and structure leaked data about business entities, wealthy individuals and public officials is just as powerful for other use cases. It turns out graph technology is also ideal in overcoming rigorous compliance challenges such as multi-layered risk management regulations, e.g. anti-money-laundering. 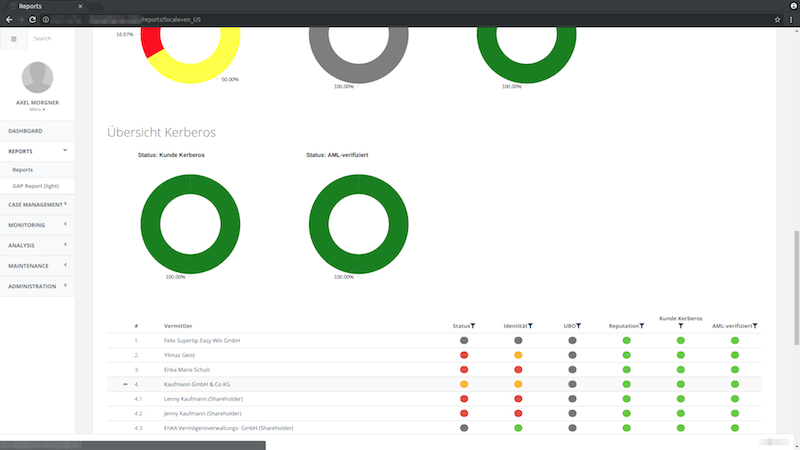 The German company KERBEROS Compliance Management Systems GmbH, together with a team at the Neo4j partner Structr, has developed an effective IT solution for risk management and money-laundering prevention. It's a great example of how to fight money-laundering and therefore corruption with Neo4j as the graph platform and Structr as the graph application platform.